A few days ago, the College Football Playoff (CFP) Selection Committee released the top four teams in college football. Clemson made its way to the leader board in first place as Oklahoma, Georgia, and Alabama followed behind claiming the second, third, and forth slots. It is easy to see that among the four teams, there are a fair number of similarities that exist between two or more teams, including the geographic concentration around the southeast (OK, GA, and AL) and the fact that two teams (GA, AL) are from the same conference (SEC). But what is one thing that all four teams have in common? They are all sponsored by Nike. It is easy to recognize Nike’s on-field presence. After all, Nike sponsors 79 of the 128 FBS college football teams, giving them roughly 62% market share. Adidas and Under Armour do not even come close (Griffith, 2017). Even more interesting is the fact that a Nike-sponsored team has won the Championship every year for six consecutive years since 2011. In addition, since all four teams in the running for the 2017 Championship are sponsored by Nike, it is a guarantee the sports apparel company will be the winner yet another year (NCAA, 2017). To add an even greater perspective, of the 2017 AP Top 25 for Week 15, Nike is the sponsor of eleven of those teams (44%) while Under Armour only sponsors five (20%) and Adidas three (12%). No one other than Nike sponsors the top five schools for the 2017 season. Surprisingly, Nike spends less money, on average, per team sponsorship than both Adidas and Under Armour. 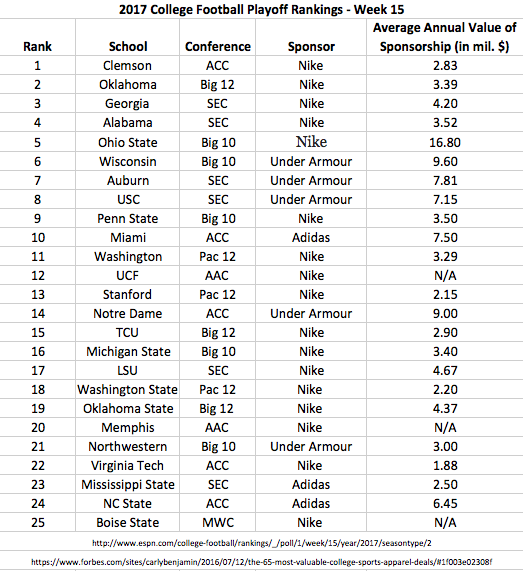 For the schools that made the Top 25, the average sponsorship valuation for Nike per school equaled about $4.60 million. Those schools sponsored by Adidas averaged $5.48 million, while Under Armour spent significantly more at $7.3 million. It may go to show that sponsorships contribute value beyond just money. 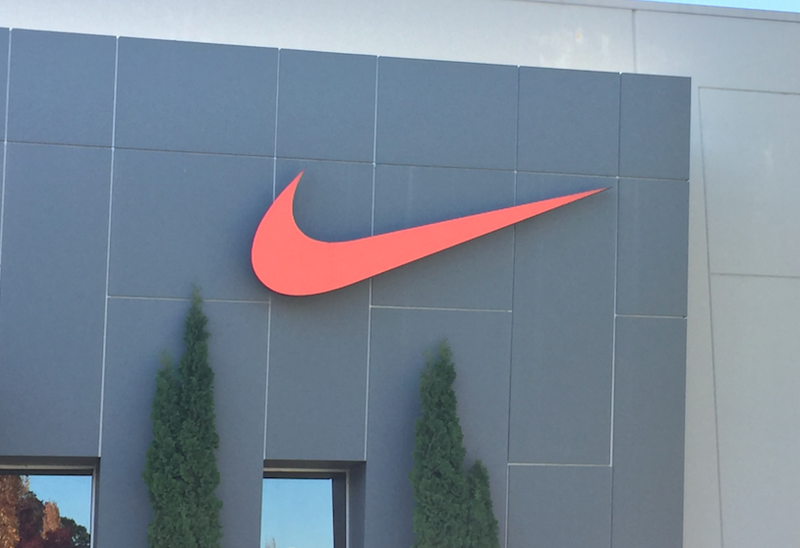 Nike proves themselves to be the best sponsor, not just because of their significant financial contributions, but because of their prestige, customer loyalty, market penetration, and most importantly association with success. This blog post was written by Samford University student Alexis Whiting.